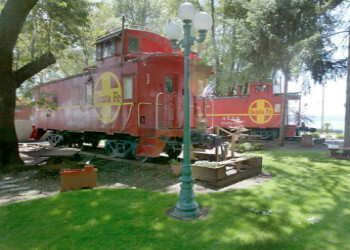 The Featherbed Railroad Company Bed and Breakfast Resort is Northern California's most unique Bed and Breakfast. The Featherbed Railroad is located right on the shore of Clear Lake in Lake County in Northern California. At the Featherbed Railroad, you get to stay in one of nine luxuriously redecorated railroad caboose suites set in a park-like setting overlooking our private dock and boat launch and beach. Lake County's Clearlake offers activities of all sorts, from boating and fishing to antique shopping. There are almost 30 premium wineries within a short drive of the Featherbed Railroad. Ecotourism is growing quickly in the region with hiking trails, kayaking and bicycling and geocaching is very popular here too. In fact, we have some great ideas for two- and three-day itineraries. The Featherbed Railroad is just two hours north of San Francisco and about 90 minutes away from Sacramento. Also near by are Mendocino and Healdsburg and Calistoga. The unhurried local attitude in Lake County makes this a wonderful destination to anyone looking to relax away the stress of work. Join us soon for a relaxing stay in a real Caboose car where you relax in your own private Jacuzzi tub and bring in some of our excellent local wine. With nature trails, fabulous water sports, bass fishing, great antique stores and more, the Clearlake area offers something for everyone and with peaceful, uncrowded country roads and a relaxed atmosphere, it's the perfect place to get away this weekend. The Featherbed Railroad Bed and Breakfast on the shores of Clear Lake in Northern California's Lake County is a unique collection of luxuriously refurbished Railroad Cabooses - most with in-room Jacuzzi tubs for two and all featuring our luxurious featherbeds. The cabooses are nestled among giant native trees in a park-like setting right on the shore of Clearlake. We feature our own boat ramp, dock and private beach. There is also a 100-year-old historic Main Station house featuring the Grand Dining Room which you can access during the day. After a crazy summer at the Featherbed Railroad Tony and Peggy took some time away and left the skeleton crew behind. Those bone heads had a great idea when they saw Celebrations, so they scared-up the spirit of Halloween and turned it into a caboose. But you better "look alive" as this caboose is only here through Halloween. Rather than just using some hauntingly familiar ideas, they boned-up for a test of your patience and created the Haunted CaBOOse. There have been members of the living who have thought it such a grave situation that we spend so much time with only a ghost of a chance of creating something frightening, but consider the fact that several of our guests actually have reported "seeing things" in the Haunted CaBOOse even as far back as when it was Rosebud. Indeed, we've had a number of guests ask who the guy was in the striped pajamas whom they've seen at night either walking through our Celebrations caboose room or actually have seen sitting on the bed. While the cabooses on our resort have only been here since the mid 1980s, the resort dates as far back as Jack Carson, Kit Carson's brother, who owned the land in the mid 1800s and grew wine grapes on the property. Indeed the centuries-old trees that make this such a beautiful spot today did so when Jack Carson and his brother Kit wandered the property as well. Our guess about the ghost is that it may be a former railroad worker, perhaps a conductor or brakeman, who are looking to get their rest aboard the caboose not knowing the calamity that will seal their doom to haunt a railroad car that will one day be a popular tourist destination. The term featherbedding is actually a railroad term that refers to the brakemen whom were put out of a work by the invention of the steam (now air) brake on trains but whose union contract was so strong that they were kept on despite not really having a reason to stay. Maybe our ghost is a permanent featherbedder! Indeed several guests have checked-out early because they claimed that an earlier railroad worker had done the same, and their proof was that they "saw" this former railroad employee in his full night shirt wandering around the caboose. Maybe it was the fabulous local wine, or maybe they saw something most don't. Either way, a stay in this caboose can give you your own first-hand experience. Of course if you dare a night in the Haunted caboose you can relax your bones in our two-person Jacuzzi tub followed by a night in our luxurious Downlight featherbed-equipped bed. There is our fabulous home-made breakfast after your night and the truly scary reality that you may have to head back to work. Yikes. The Haunted CaBOOse started its life as a caboose on the Southern Pacific rail line. Southern Pacific built these cabooses with bay windows instead of a cupola on the top. Since it's one of the first cabooses on the property, many of the gauges, air lines and electrical lines are still in place from its service on the railroad. We've highlighted these fittings in a beautiful wine-colored hue and restored all their copper brackets. That same color extends to the trim along the walls. There is a new climate control system and all-new Jacuzzi tub system. The Haunted Caboose includes a cauldron, er, Jacuzzi tub for two. The in-suite bathroom features a toilet and sink and there is a shower head for use with the Jacuzzi tub. All Featherbed cabooses are equipped with a coffee maker, personal refrigerator and television. There is a quaint breakfast nook in the Haunted CaBOOse where you can enjoy your breakfast or some wine you bring in from the local wineries. 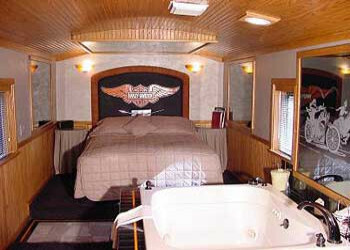 All of our cabooses feature a queen sized bed with a luxurious Downlite genuine goose down featherbed.